The Earth today is choking on pollution – PCB’s that linger and do not degrade, and plastics that form vast floating islands in the oceans as they likewise refuse to degrade. 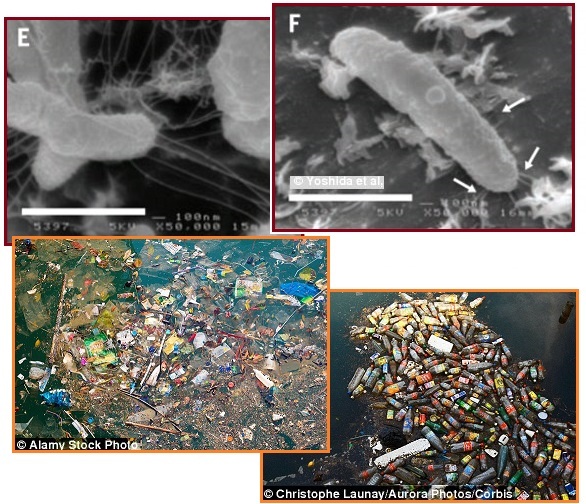 Recent good news from a Japanese lab is that a new bacteria has emerged that breaks down this intractable plastic. It appears that this, and perhaps other, bacteria have evolved to meet the need or rather to take advantage of a new food source. Evolution is not something that occurred eons ago and is now in the past. Evolution is ongoing! Millions of non-biodegradable plastic bottles containing polyethylene terephthalate, or PET are made every year - and many end up littering streets and oceans. Now Japanese researchers have discovered a bug that 'eats' these compounds, offering the tantalising hope of a cleaner planet in years to come. By screening bacterial candidates able to break down the tough material, they came across Ideonella sakaiensis 201-F6, which is able to use PET as its source of energy. Researchers from Keio University in Tokyo have identified a bacterial hero. Polyethylene terephthalate, used in most disposable water bottles, is considered one of the world's most environmentally damaging plastics. Researchers found a potentially planet saving bacteria thrives on the plastic and can break it down to consume. Polyethylene terephthalate (PET) is also used in other products such as polyester clothing, frozen-dinner trays and blister packaging. But this material was only invented 70 years ago, which leads researchers to believe the bacteria evolved the ability to break it down and consume it. After the bacteria latches on to the PET surface it releases one of the enzymes to produce an intermediate chemical, which is then consumed. The second enzyme breaks it down even further into carbon that provides the bacteria with more energy. 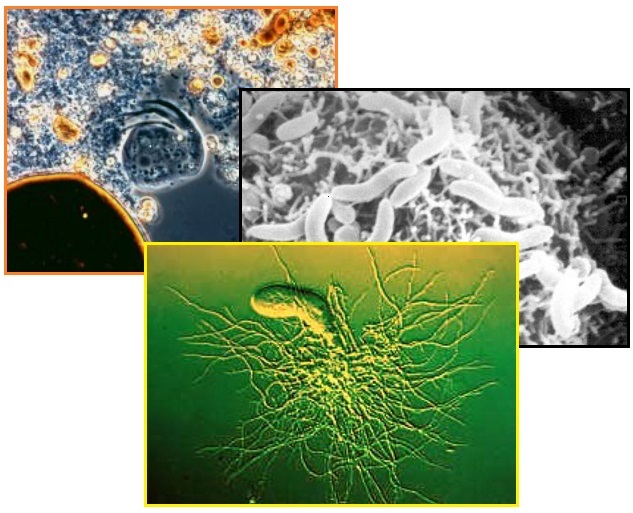 Just like the probiotic bacteria in our intestines, which aid our digestion, there are oil eating bacteria in nature. Remember the Gulf Oil spill, when it appeared the amount of oil had overwhelmed the oil eating bacteria in the Gulf? Where were those little buggers? Then the miracle emerged, as the oil eating bacteria reproduced and grew in numbers. All that yummy oil as a food source! These microscopic life forms are blooming as a result of the oil spilled into the Gulf of Mexico from the Macondo 252 deep-sea well. The Zetas have long been asked about the Aftertime, after the Pole Shift has destroyed industrial centers filled with chemicals such as sulfuric acid and bleach. Will cities become cesspools, unlivable, due to ruptured tanks of such chemicals? Per the Zetas, it will not be those helpful bacteria that come to the rescue, but the hurricane force winds during the hour of the Pole Shift, and the great tidal waves that wash the coastlines during the Pole Shift, and the torrential rains that pound the Earth for some time after the Pole Shift will disburse these chemicals, which then lose their noxious power. ZetaTalk Insight 1/15/1996: Poisons, such as acids or caustics, do their worst damage because of their concentration. Diluted, they are essentially harmless. Between the tidal waves, the torrential downpours that seem endless after the cataclysms, and the hurricane force winds that accompany the pole shift, dispersal and dilution is very thorough. Even radioactivity is only a poison because mankind gathered it together, and if allowed to disburse, would be as the cave man found it. 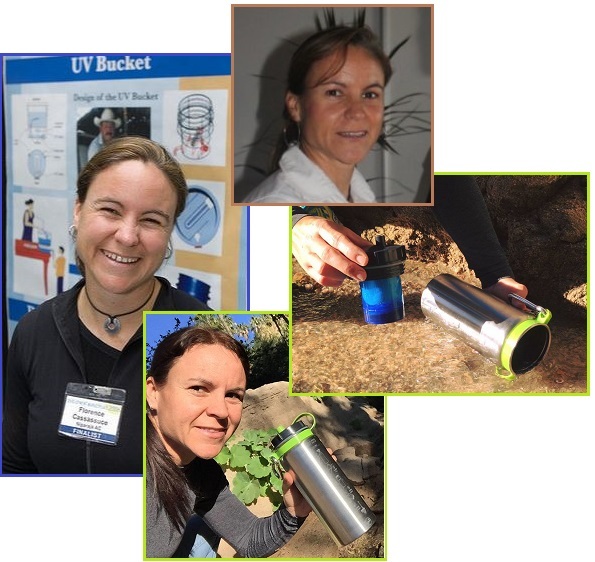 You may be surprised to find that your chemicals, combined, reduce each other's impact! These noxious chemicals were once non-noxious, in nature, and find their way there again. Wetlands are a feature of nature, occurring naturally along rivers and in low lying lands. But in man’s greed to possess every acre of land for suburban sprawl or even industrial parks, wetlands have been eliminated, filled in with dirt. Dykes and levees have been constructed to hold back seasonal floods. The great quakes during the Pole Shift will break these artificial barriers, and allow river water to flood what was formerly wetlands, re-establishing them. Wetlands are a key cleanup tool. In Nature, it is the flow through the marshlands that cleans the sewage effluent. 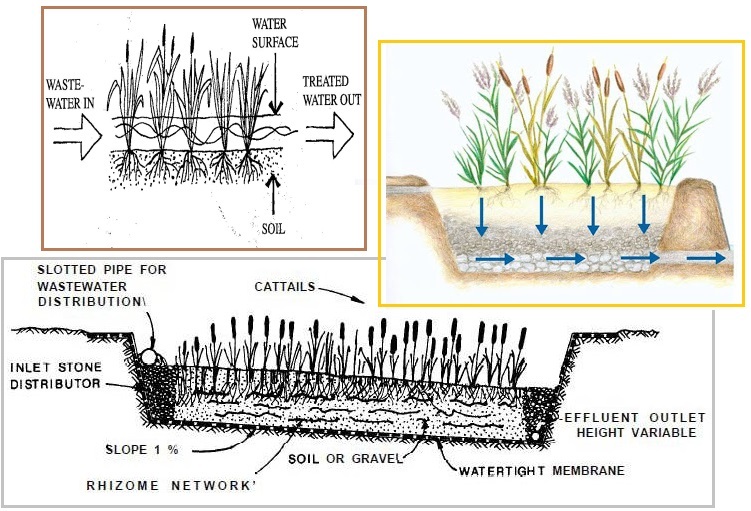 In constructed wetlands, compressed in space, the waste water comes in high and leaves at a lower outlet, thus forcing the flow through the plants. Toxins enter the wetlands through farms, factories and runoff. These toxins are broken down or otherwise buried using a variety of bacteria. Wetland systems significantly reduce biological oxygen demand (BOD), suspended solids (SS), and nitrogen, as well as metals, trace element, and pathogens. Water is distributed across the surface of a sand or gravel bed planted with wetland plants; the water is treated as it percolates through the plant root zone. Even when the water looks clean, the Zetas have repeatedly warned that drinking water, or water to be used for cooking, needs to be distilled. Distillation not only kills pathogens that can cause infections, it also leaves heavy metals behind in the base boiling water. Lead poisoning will be a big concern, as this rises up, temporarily, in the magma swelling into cracks in the Earth and will be present in the volcanic ash that dusts down from the sky. ZetaTalk Advice 8/15/1995: During the pole shift volcanoes, old and new, will violently explode. The resulting ash will sift down from the upper atmosphere for decades, poisoning ground water. Humans driven to drink this gritty water will find more than grit between their teeth, they will find their nervous system beginning to fail them. After a cataclysm the lead heavy mantle has been spewed out over the landscape, most of this vomit in the form of fine billowing dust. Our advice on distilling water to remove heavy metals such as lead presumes that volcanic ash will be falling, be included in the rain or fog, and accumulate on the ground. What about nuclear pollution? Survivors of the Pole Shift will not be alone in this struggle. The Zetas have hinted at help in the future. Do they have a chemical that can neutralize radioactivity? I, Nancy, watched a demonstration done for MJ12. A Geiger counter was waved over a canister that included radioactive material, and crackled. Then a Zeta came forth with a clear liquid in a vial, pouring this into the canister. Then the Geiger counter again, which was utterly silent! Just because this kind of expertise is available, among the Service-to-Other visitors who work under the direction of the Council of Worlds, does not mean that mankind should be complacent. The Earth is mankind’s school house, and as in the past, man is to learn from his mistakes. Thus, nuclear disaster are a possibility, with innocents suffering as a result. ZetaTalk Insight 12/15/1999: Can we straighten out pollution? Yes. This is in the main done even before the transformation to 4th Density. We are already affecting the planet Earth, as we are resident on Earth and intended to be future residents, ourselves and our hybrids are counted in decisions on whether we can affect our future home. We can also simply alter radioactivity. Man tends to think of this as something that takes thousands, perhaps millions of years in half life spans to affect radioactivity, but what causes radioactivity is the structure of the atom and the nucleus, and this can be altered by chemistry just as the nature of hydrogen and oxygen forming water is an alteration. All atoms are affected by what they come in contact with. None stand alone. All of them are affected. Meanwhile, some Service-to-Other humans on Earth are not waiting. From Cambodia to Mexico to Cuba to the Mississippi, cleanup is underway. Aki Ra was forced at the age of 10 as a child soldier to work planting mines for the Khmer Rouge. Now grown he is risking his life daily to remove mines. He is not only making things safe for others, he has also adopted 30 orphaned kids as his own! Irania Martinez Garcia of Guantanamo, Cuba, who lost a daughter to leukemia due to the burning plastics, has taught hundreds of residents to learn how to grow food efficiently while using organic and sustainable materials from the local dump and their own trash. Garcia's idea was to clean up the dump by organizing it into organic and inorganic piles, and then use the organic material to make compost, which would be used to plant fruit trees. The inorganic materials would be stripped down to the core and resold for parts. Chad Pregracke, has helped pull more than 67,000 tires, 218 washing machines, 19 tractors, 12 hot tubs, four pianos and almost 1,000 refrigerators from the Mississippi River and other waterways across the United States. All this is then recycled. 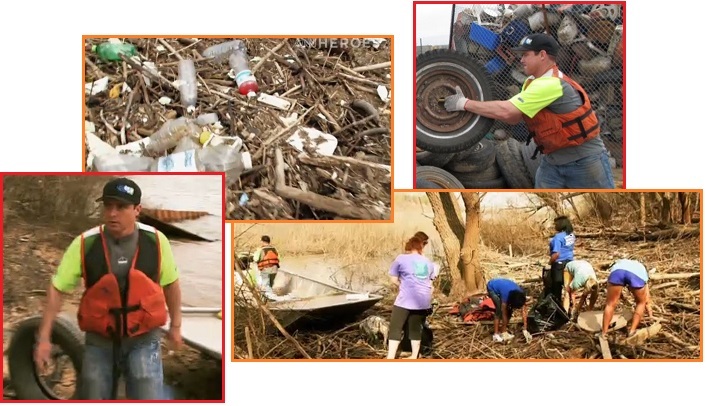 He and his crew organize community cleanups along rivers across the country. Chad’s passion for the work is contagious, and his humor creates an upbeat atmosphere. 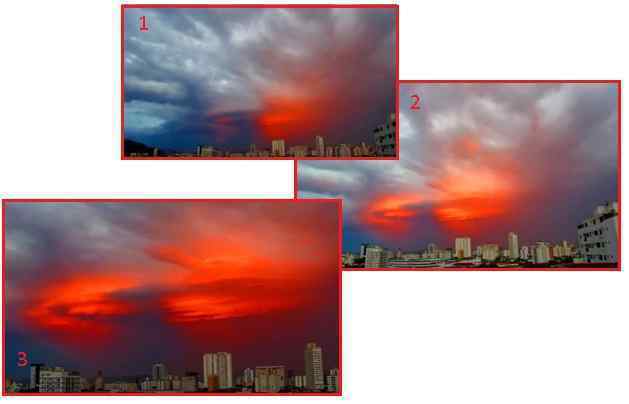 A brilliant Second Sun video was captured during a Brazil sunset on March 3, 2016, along with the reflection of this dual sunset on the cloud bank to the East. Note that where Nibiru is normally found at the 4 o’clock position to the Sun in the Northern Hemisphere, in this video the Second Sun shows up at the 9 o’clock position. This is due to the slant of the Ecliptic in the Southern Hemisphere, which is opposite the slant seen from the Northern Hemisphere. Per the Zetas, seeing Nibiru as a distinct orb is NEW, indicating Nibiru has drawn closer. Previous captures showed the Second Sun as a glow and/or a reflection. 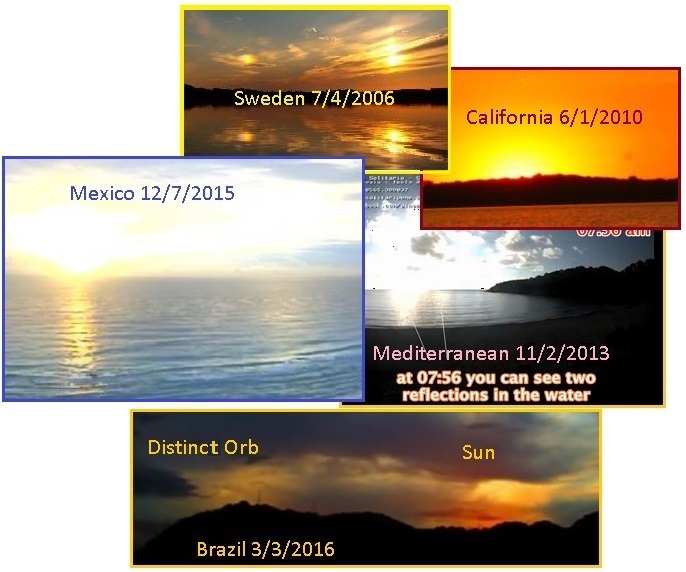 ZetaTalk Observation 3/12/2016: This dramatic video captures a clear Second Sun, located where Nibiru would be in a view from the Southern Hemisphere. The Second Sun is distinct as an orb, not just a glow, and if compared to former captures of the Second Sun will show that it is drawing closer to the Earth. The combined sunlight, both from the Sun itself and from sunlight bouncing off the vast dust cloud shrouding Nibiru, created an intense reflection on the clouds directly to the East of the setting Sun. Such drama will be on the increase, around the world, making it clear to the populace that they are dealing with a planetary body nearby, and that the establishment has been lying to them about it. An examination of past Second Sun captures on film does indeed show that they are invariably a glow, with a reflection on the water possible, but without a clear outline of a distinct orb in the center of the globe. This can be seen in 2006, 2010, 2013, and 2015. The Brazil video capture is new! As Nibiru draws closer, the Earth is more distressed. She is trying to align magnetically with the Sun but the N Pole of Nibiru is pointing directly at the Earth, thus the Earth wobble caused by the Earth’s N Pole being pushed away on a daily basis, and later bouncing back as the Earth attempts to re-align with the Sun. This Earth wobble has been described as a Figure 8, discernable from reading taken around the world as far back as 2004, after Nibiru had entered the inner solar system. At first, the Figure 8 was gentle, them more aggressive, swinging in wider arcs. At times, the Earth would try other maneuvers, such as a temporary lean to the left or pointing into opposition. ZetaTalk Comment 11/27/2010: If Planet X moves slightly, the Earth may suddenly move into opposition, as she has before pointing her N Pole toward the Sun. Or the Earth may flip sideways into a temporary lean to the left, thrown sideways. ZetaTalk Comment 7/4/2015: What to expect as the wobble worsens is that the swings will get more extreme, may suddenly switch about into opposition or a temporary lean to the left, ultimately arriving at the Last Weeks. Measure where your sunball rises to determine the progress of the wobble. A dramatic swing akin to a temporary lean to the left happened on March 3, 2016, captured by Alberto in Italy. 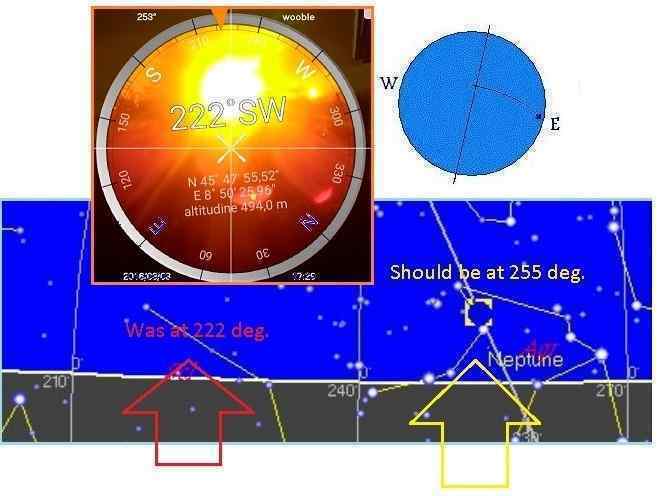 He registered the sunball at sunset at Azimuth 222, a full 33 degrees too far South, in the southwest. On this day, many reported to me via email that there seemed to be a hush on the Earth, a sudden silence. Dogs who were normally restless were sleeping. The birds outside were less raucous. In addition, earthquakes were suddenly down, of a smaller magnitude. The Sun on 3/3 at 17:29 is way too far to the SouthWest. An impossible position as the expected position. The tilt of the globe for Europe was also causing a more northerly sunrise, as observed from Germany. My observations at sunrise in Germany are that since March 3 a change in location was noticable - about 10-12 deg to far N-NE. Instead of continuing to rise to ES-S, the Sun thereafter went up very steeply, almost over head. 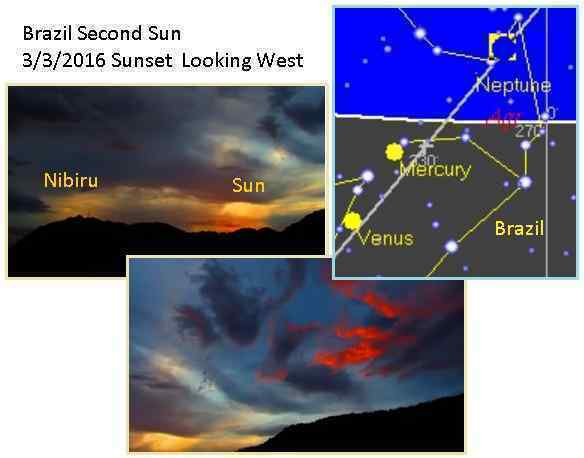 This tilt to the northeast for sunrise was also visible in Wisconsin, from an observer who kept immaculate records in January and February, 2016. Sunrise from Wisconsin was late and too far north, consistently. In January, 2016 the sunrise is consistently late by 15-20 minutes, and too far to the North by up to 22 degrees. 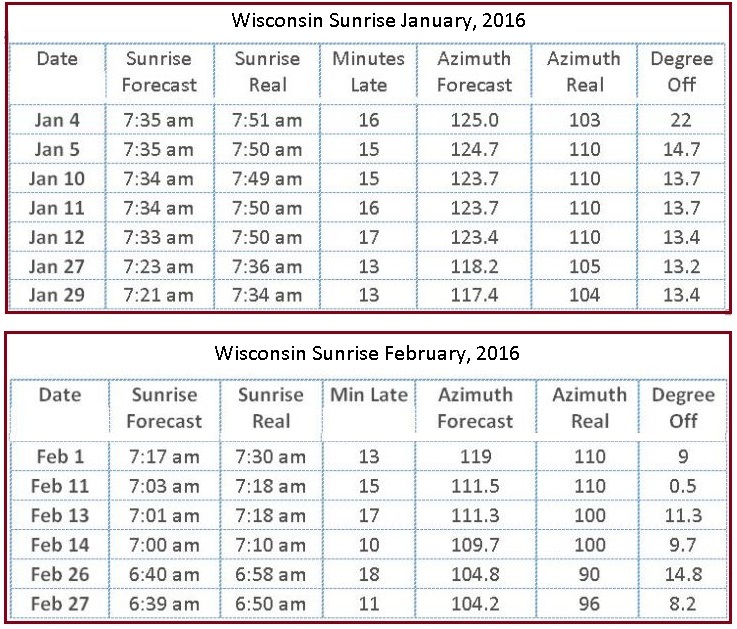 In February, 2016 the sunrise is consistently late by 10-15 minutes, and too far to the North by up to 15 degrees. ZetaTalk Observation 3/12/2016: We have mentioned in the past various maneuvers the Earth can do to evade magnetic conflict with the approaching Nibiru. As Nibiru approaches, he is in the line of sight with the Sun, so the magnetic conflict is unavoidable. The Earth literally jerks back and forth to align first with the Sun, then with Nibiru, then back with the Sun. This jerking around causes the plates to jerk around, thus acute 7 of 10 plate movements. We have mentioned that the Earth will, on occasion, try to ease this conflict by pointing its N Pole away to the left, in a temporary Lean to the Left. It may also ease this conflict by pointing its N Pole toward the Sun, in a temporary Lean into Opposition. It has been noted recently that the Arctic is melting, and the tilt of the Figure 8 over Europe so extreme that sunset is fully 33 degrees too far to the SouthWest and sunrise noticeably in the extreme NorthEast. This is neither a Lean to the Left nor a Lean into Opposition, but is an accentuated wobble. Does this ease the pain of the wobble on the Earth plates? It does indeed, just as a boxer in the ring would find the blows not hitting as hard if he deflected to the right or left, moving with the punch. Thus creatures who had been almost perpetually distressed by the electronic screech would find peace, and humans hearing the quiet would be perplexed. 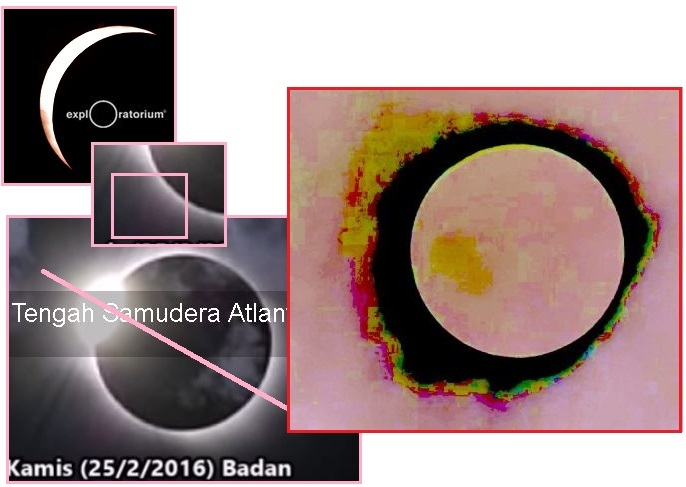 The total eclipse of the Sun on February 25, 2016 revealed little of Nibiru or its vast debris ridden dust cloud and Moon Swirls. As usual, photos and videos of the eclipse were forced by the brightness of the Sun to reduce the glare, so that even the stars in the sky beyond the Sun were not visible. Only the Sun, and its corona, are visible. Nevertheless, a pink round glow did appear in the direction where Nibiru would be expected in Video and still photos. The eclipse was visible in Indonesia, which is right on the Equator. 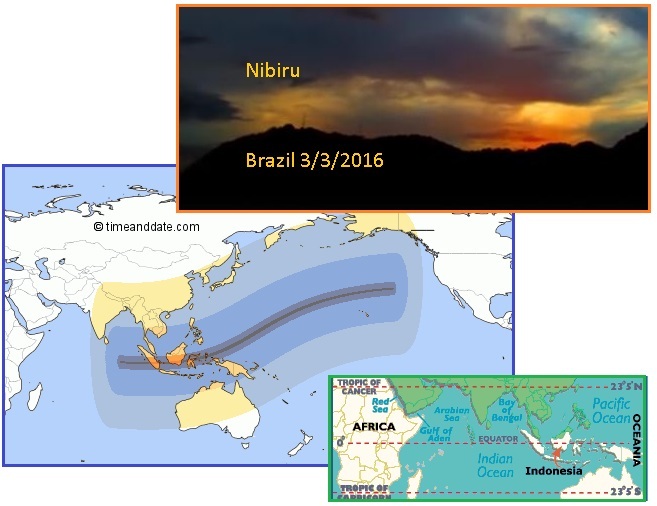 In the Northern Hemisphere, Nibiru is seen at the 4 o’clock position of the Sun. In the Southern Hemisphere, it is the 11 o’clock position. Thus the pink glow that is seen, in the shape of an orb, is mid-way, at the 7 o’clock position. Another factor in the failure of Nibiru to make an appearance is its current distance from the Sun. The Zetas have emphasized that during the 8 of 10 phase Nibiru seems to pull to the right, but in actuality it is the Earth that has pulled to the left as far as possible. Thus, it would be outside of the view of the many cameras focused on the total solar eclipse.